Summary (from Goodreads): Growing vegetables is a rewarding and cost-effective way to eat better for less. Yet many don't know where to start. Author and farmer Catherine Abbott answers questions like: What is the best way to maximize my garden space?How do I get started growing food to sustain my family? Can I grow vegetables inside my house? How can I tell if my vegetables are primed for eating?Will I really save money by growing my own? You will find affordable tips on how to plant and harvest more than thirty common vegetables, from spinach and eggplant to corn and beans. Abbott's expertise shines on planting, fertilizing, watering, weeding, and troubleshooting. 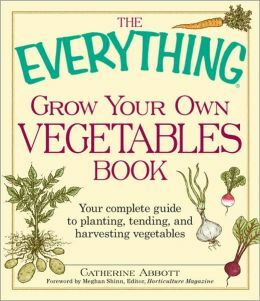 This book has "everything" you need to grow fresh, delicious veggies in any climate, any time of year! Absolutely love it. I've been wanting to begin growing some of my own food! If you're systematic like me, this book will be incredibly helpful because it lays everything out in order, almost like step-by-step instructions. Catherine Abbott takes vegetable gardening and applies it to the whole family, so your kids can learn right along with you. I also enjoyed the incorporation of random facts and tidbits throughout the book. I found them helpful and entertaining. One of them talks about allowing your children their own space to grow a garden, and what exact vegetables are going to be the easiest for them to start. If you're a beginner gardner like me, this book is greatly detailed and informational with a solid structure. I am currently starting my garden this season, and I will update here what my outcome will be after using Ms. Abbott's method!